How do I setup continuous feed labels for my LX800-810-400? 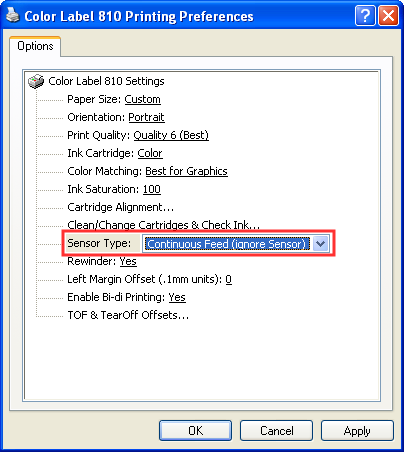 > Knowledge base> Article: How do I setup continuous feed labels for my LX800-810-400? How do I setup continuous feed labels for my LX800-810, LX400? Continuous Feed is used for label stock that has no black mark, die cut or through hole. The label sensor will be turned off and the LX will start printing at whatever point is nearest. 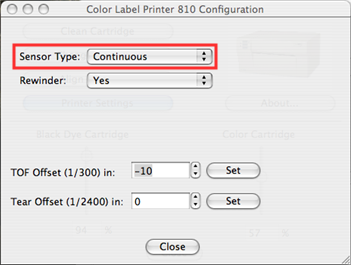 Use this setting only for stock that will be cut after printing. It is not possible to use this setting for labels that are die cut since it is impossible to reliably predict the starting point of the print and impossible to adjust the spacing gap between prints. 1. Unload the label stock. Make sure the LX is turned on and the USB cable is connected. 2. Go to the Start Menu - Printers and Faxes, or Start Menu - Control Panel - Printers and Faxes. 3. 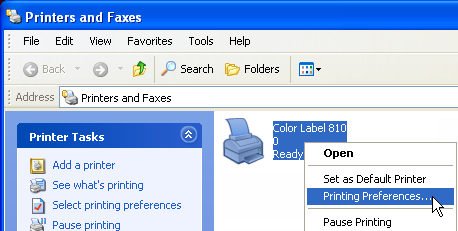 Right Click on the Color Label 800 or Color Label 810 - Choose Printing Preferences. 4. Find the Sensor Type setting and change it to Continuous. Apply settings and close the window. 5. Feed the stock into the printer according to the instructions on the label attached to the inside cover of the Color Label Printer. Note 1: When using NiceLabel the printer settings are saved with the label file. In other words, if the label was created in NiceLabel and saved before the Sensor Type setting was changed to Continuous, you will have to change the Sensor Type setting through NiceLabel and resave the label before printing. Note 2: If you are using an LX800, your firmware version must be greater than 2.00 and your driver version must be greater than or equal to 1.10(PC) or 1.1 (Mac). Click here for instructions on determining your firmware version. Click here for instructions on determining your driver version. 2. Browse to the Hard Drive - Applications - Utilities - Printer Setup Utility. 3. The Screen Below will be displayed. Highlight the Color Label Printer and click the Utility icon. 4. The Printer Configuration window will open. Click the Printer Settings Button. 5. Set the Sensor Type to Continuous. Close this window and the Configuration window. 6. Feed the stock into the printer according to the instructions on the label attached to the inside cover of the Color Label Printer. Please note: If you are using an LX800, your firmware version must be greater than 2.00 and your driver version must be greater than or equal to 1.10(PC) or 1.1 (Mac). Click here for instructions on determining your firmware version. Click here for instructions on determining your driver version.